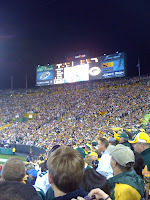 Packers vs. Buccaneers tickets are still available for Sunday's game at Lambeau Field. Catch the Packers in action as they seek to extend their perfect record to 10-0. The Packers have not defeated the Tampa Bay Buccaneers since 2003, but something tells me that Sunday will be different. The Buccaneers have a 4-5 record and have lost to both the Bears and the Saints, two teams that the Packers have easily defeated. Packers tickets that are ordered between now and Sunday can be picked up in our Green Bay office, which is located just a block south of Lambeau Field on S. Oneida Street.